Successfully Added Xiaomi Note 3 Smartphone - Android 7.1.1, Octa-Core Snapdragon CPU, 6GB RAM, Face-ID, FHD Display, 3500mAh, 12MP Dual-Rear Cam to your Shopping Cart. The Xiaomi Note 3 is one of China’s latest Android phones that treat you to state of the art hardware and software features. With this flagship smartphone, Xiaomi has once again managed to impress the global smartphone industry. The Xiaomi Note 3 Android phone runs on the Android 7.1.2 operating system, thus guaranteeing a smooth user experience. It comes with Dual-IMEI numbers for extra connectivity and naturally supports 4G, Dual-Band WiFi, and Bluetooth 5.0. With this Android phone at your side, you’ll always stay within reach to friends, family, and colleagues. Packed within its ultra-slim body, this Xiaomi Note 3 smartphone packs the impressive Snapdragon 660 processor. This Octa-Core CPU has been clocked at 2.2GHz and is really capable of delivering a punch. Along with a whopping 6GB of RAM, this latest smartphone is guaranteed to handle anything you throw at it. Whether it’s Full-HD movies, demanding games, or the latest Android Apps – nothing is too much for the Xiaomi Note 3 smartphone. The phone treats you to 128GB ROM so you won’t have to worry about storage space for all your downloaded files and media. With its powerful 3500mAh battery, this latest Android phone lets you enjoy all it has to offer for up to 10 hours straight. This means that you’ll be able to browse the web and watch multiple films and series on the phone’s 5.5-Inch Full-HD display for hours’ to come. The screen treats you to crisp 1080p resolutions, thus assuring a breathtaking media experience. For all smartphone photography lovers among us, the Note 3 comes with a 16MP front snapper and a 12MP Dual-Rear camera that is capable of shooting stunning 4K video. 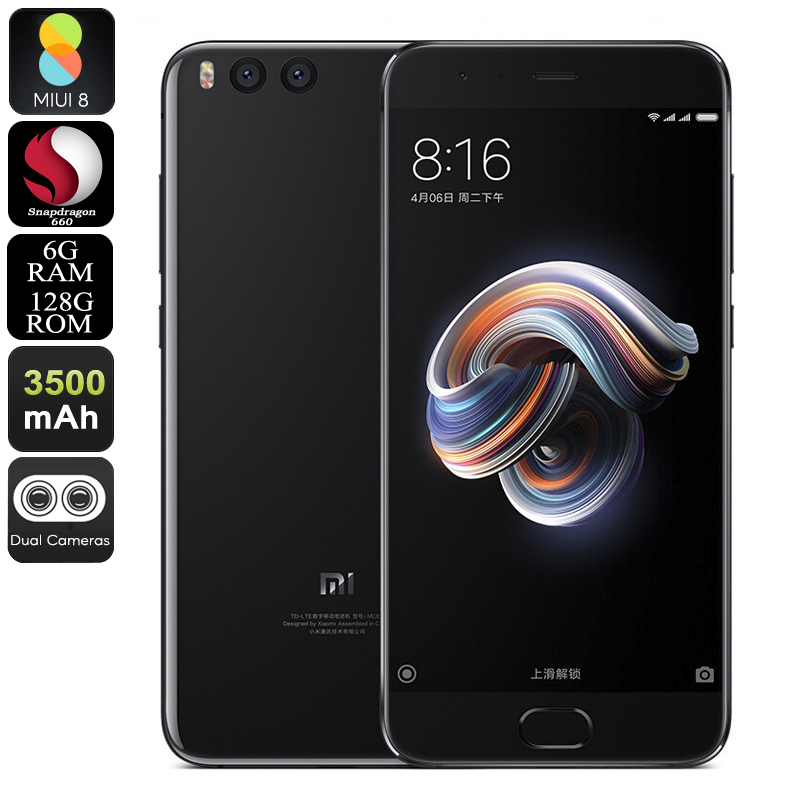 The Xiaomi Note 3 smartphone comes with a 12 months warranty, brought to you by the leader in electronic devices as well as wholesale Android phones..